Essentially, this is 'Doctor Who' reboot 2.0. Russell T Davies takes all his experience from the first two series and distills them into a second pilot episode. But it's a pilot episode informed by the rules of engagement established since 'Rose'. And what fun it is. Confident and witty, the introduction of Martha Jones feels more assured than that of Rose Tyler. Granted, back in 2005 an awful lot was being gambled on with the new series but here, two years in, we've been given something that takes the familiar tropes and gives them a jazz treatment, free associating playfully with our expectations and associations. Cue the Doctor in pyjamas and dressing gown again and Martha's cousin as well as a recap of various alien incursions on Earth in the last two years. The general theme here is one of crime and punishment. The Judoon, beautifully designed space police rhino thugs by way of 'Hitch Hiker', are tracking down a Plasmavore, hiding in plain sight as a dotty old lady played by the marvellously arch Anne Reid. The kids won't sleep knowing their granny could be a blood sucking creature from outer space. Back to our theme then, prisons...prisons....prisons. Martha trapped in the escalating domestic disputes of her own family, caught in the mundane reality of death and taxes and the Doctor doomed to wander the universe alone whilst the Judoon catalogue anyone and anything in a merciless tyranny of numbers. A bizarre satire on the management hell of NHS trusts then? Even in space, you're a statistic. The hilarious squeeky marker pen crosses betray a deeper symbolism - you will conform or die. The cross represents the individual idealised, the crucifix an enforcement of conformity. Just don't go breaking vases over the heads of rhino space police any day soon. It upsets their cataloguing and the due process of the law. And the Plasmavore has murdered a child. Yes, from the description it sounds like Shirley Temple meets Bonnie Langford but to kill another being because they had a fresh complexion and a curly barnet is a sign that you've been swallowed by the 'darkness' to come. The criminal is oh so familar with the underworld, has a deep relationship with the darker side of life, knows how to duck and dive. Strangely, the Plasmavore and the Doctor are functioning opposites - both pretend to be patients in the hospital to gain their own advantage. The Plasmavore is a hacker, swiping identities to hide in plain sight, the Doctor is a freakish Time Lord gigolo luring Martha into his TARDIS. Granted, he sacrifices his own identity to flush out the interloper. So what of Martha? 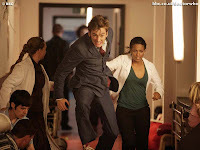 Personally, I think Freema hits the ground running. She's quite splendid in this opening episode and establishes the character not just in a broad sense but in the smaller details. Her humanism is right to the fore when she pauses to close the eyes of the now deceased consultant, Mr. Stoker (yes, a little nod to Bram there). She respects the dead and the dying and understands completely that the Doctor has sacrificed himself to save the day. She doesn't muck about and takes quite a lot in her stride. Her sentimental side will, I think, be the force that drives the forthcoming series as she tries to keep her feelings about our favourite Time Lord in check. That she bookends the entire episode is entirely fitting and like 'Rose' the story is told from her point of view. It's important that she remains the audience identification figure. The way Freema handles much of this in the episode is an indication that we're in safe hands. Tennant's Doctor seems a little more world weary here. You get the sense he's been travelling alone for a while but I do think there was too heavy an emphasis on the 'seduction' of Martha to his lifestyle. There was a feeling of him shopping around for his next companion in this and the scene in the alley did have an odd predatory, sexual undertone that didn't belong to the series. However, overlooking this aspect, Tennant's performance throughout was confident and boisterous without recourse to some of the over-acting in the earlier parts of Series 2. The tone has shifted and he's picking up and recycling little physical ticks and speech patterns that are uniquely his own with a good deal of sensitivity. I really got a sense of his Doctor this time round. And Anne Reid was both funny and frightening as Florence. Her lip-smacking performance was pitched just right and she clearly homed in on the requirements of the script with Russell's typical volte face of wit and horror. On the production front we've moved up a notch again. Fantastic work from the boys at The Mill especially the fetishistic, phallic Judoon spaceships landing on the Moon which then carried through to the rhinos in leather look of the costumes. Great prosthetics from Millennium and Neil Gorton but it was obvious that the budget only allowed them to have one helmet-less Judoon in the story. And Murray Gold...will this man ever stop coming up with the goods? Lovely music, gorgeous theme for Martha which I'm sure will have many iterations over the coming weeks and some finely judged solo strings amongst the bombast of the Judoon's marching themes. Overall, then...bureaucratic rhinos from outer space taking the free market to extraordinary lengths to try and keep their statistics up to date, identity theft from a little old lady called Florence and the Doctor's symbolic death and re-birth as witnessed by one Martha Jones. The fact that Russell T Davies juggled that lot and threw laughs aplenty in there too is quite astonishing. Plus some prefiguring of the coming darkness, an indication that the Doctor did have a 'brother' and Martha's take on the TARDIS as a spaceship made of wood.